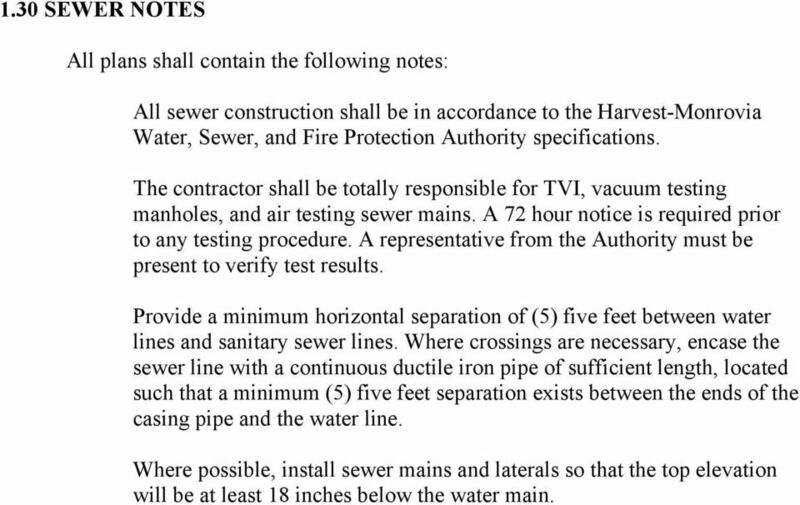 2 SECTION Purpose The purpose of this document is to assemble the sewer specifications, policies, and procedures that have been adopted by the Harvest-Monrovia Water, Sewer, and Fire Protection Authority. For any design questions not covered in this manual refer to the Recommended Standards for Wastewater Facilities, Great Lakes-Upper Mississippi River Board of State and Provincial Public Health and Environmental Managers, Ten States Standards, latest revision Approval Any entities desiring sanitary sewer service within the service area of Harvest- Monrovia Water, Sewer and Fire Protection Authority shall submit to the Authority the following items: A Topographic map outlining the drainage area. A layout of the proposed sewer line along with proposed lot lines, water lines, and streets. Flow Calculations this must include all present and future users for each drainage area. All assumptions used to determine flow must be included. A review fee of $250. This information should be submitted a minimum of fourteen (14) days before a Board meeting in order for it to be considered by the Board. Once it is determined that sewer service can be provided to a development and the Board has approved the addition a detailed set of construction plans shall be submitted. 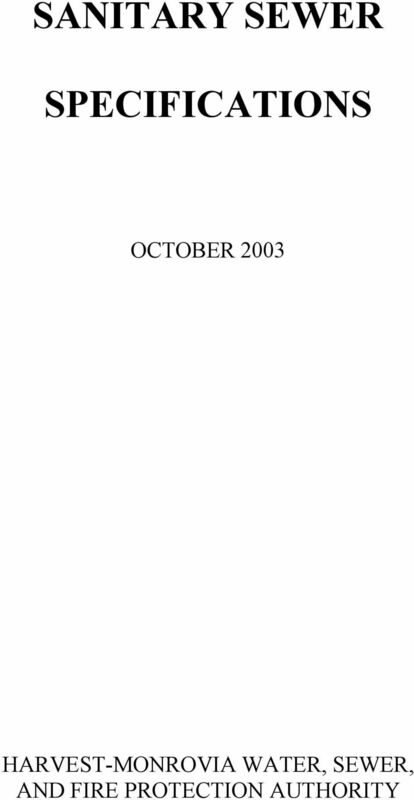 These plans shall meet the requirements of section 2.20 of this manual. 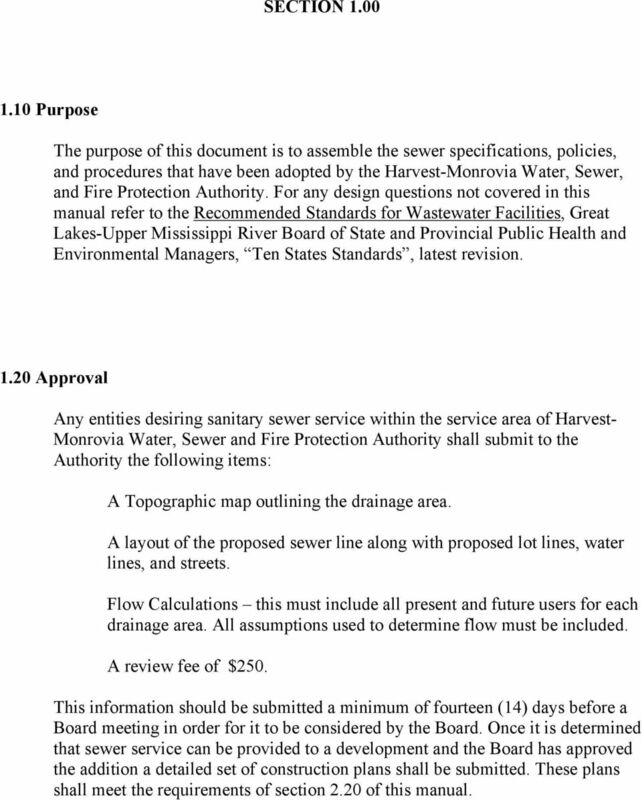 3 1.30 SEWER NOTES All plans shall contain the following notes: All sewer construction shall be in accordance to the Harvest-Monrovia Water, Sewer, and Fire Protection Authority specifications. The contractor shall be totally responsible for TVI, vacuum testing manholes, and air testing sewer mains. A 72 hour notice is required prior to any testing procedure. A representative from the Authority must be present to verify test results. Provide a minimum horizontal separation of (5) five feet between water lines and sanitary sewer lines. Where crossings are necessary, encase the sewer line with a continuous ductile iron pipe of sufficient length, located such that a minimum (5) five feet separation exists between the ends of the casing pipe and the water line. Where possible, install sewer mains and laterals so that the top elevation will be at least 18 inches below the water main. 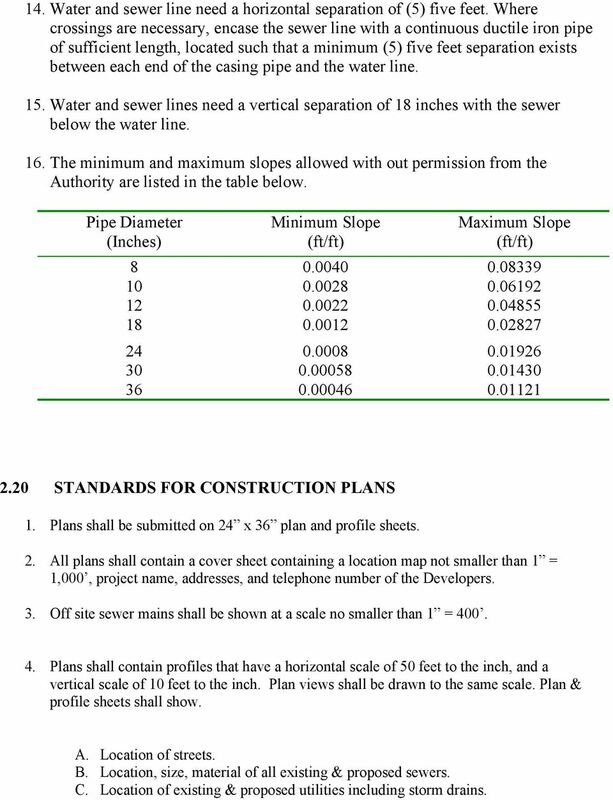 4 SECTION DESIGN SPECIFICATIONS FOR SANITARY SEWER 1. Sanitary sewers to be dedicated to the Authority shall be constructed within dedicated easements or dedicated right-of-ways. 2. Sewers shall be designed and constructed to give a minimum design velocity of 2 feet/second and a maximum velocity of 10 feet/second. 3. The minimum line size is 8 inches in diameter. 4. Sewers 8 inches in diameter shall be constructed of either Ductile Iron sewer pipe or PVC sewer pipe. 5. 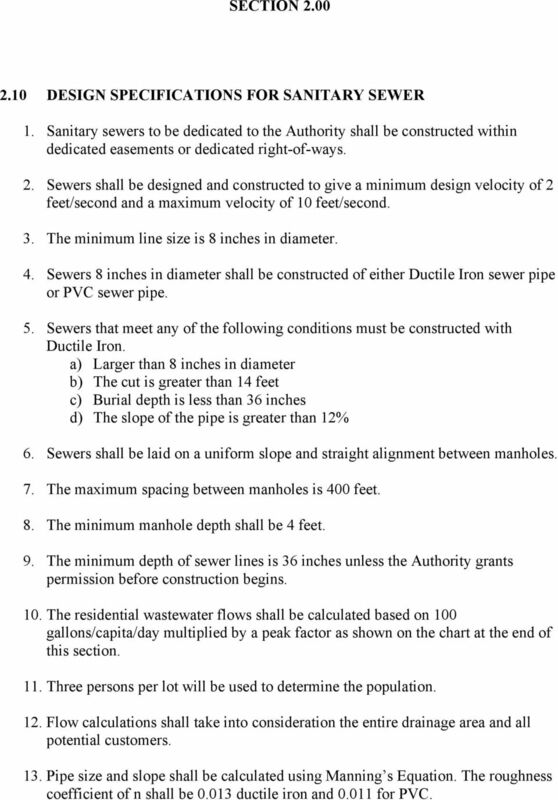 Sewers that meet any of the following conditions must be constructed with Ductile Iron. a) Larger than 8 inches in diameter b) The cut is greater than 14 feet c) Burial depth is less than 36 inches d) The slope of the pipe is greater than 12% 6. Sewers shall be laid on a uniform slope and straight alignment between manholes. 7. The maximum spacing between manholes is 400 feet. 8. 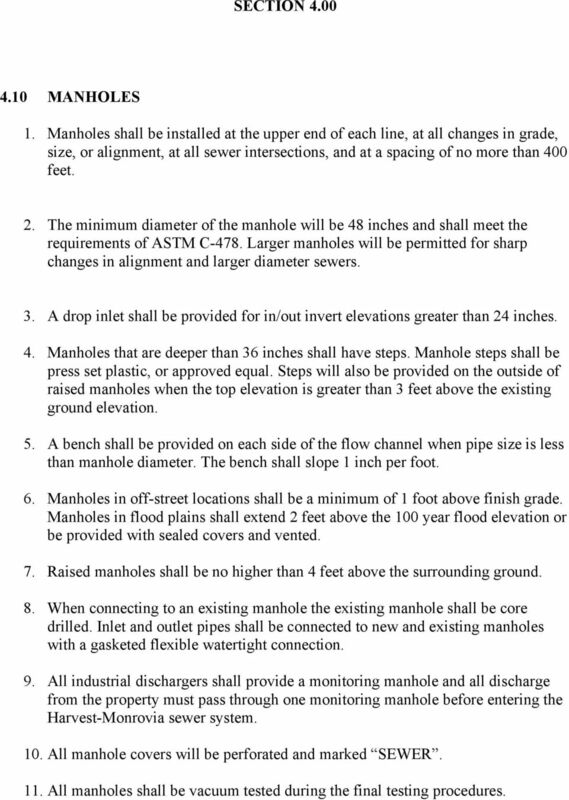 The minimum manhole depth shall be 4 feet. 9. The minimum depth of sewer lines is 36 inches unless the Authority grants permission before construction begins. 10. The residential wastewater flows shall be calculated based on 100 gallons/capita/day multiplied by a peak factor as shown on the chart at the end of this section. 11. Three persons per lot will be used to determine the population. 12. Flow calculations shall take into consideration the entire drainage area and all potential customers. 13. Pipe size and slope shall be calculated using Manning s Equation. The roughness coefficient of n shall be ductile iron and for PVC. 5 14. Water and sewer line need a horizontal separation of (5) five feet. Where crossings are necessary, encase the sewer line with a continuous ductile iron pipe of sufficient length, located such that a minimum (5) five feet separation exists between each end of the casing pipe and the water line. 15. Water and sewer lines need a vertical separation of 18 inches with the sewer below the water line. 16. The minimum and maximum slopes allowed with out permission from the Authority are listed in the table below. Pipe Diameter (Inches) Minimum Slope (ft/ft) Maximum Slope (ft/ft) STANDARDS FOR CONSTRUCTION PLANS 1. Plans shall be submitted on 24 x 36 plan and profile sheets. 2. All plans shall contain a cover sheet containing a location map not smaller than 1 = 1,000, project name, addresses, and telephone number of the Developers. 3. Off site sewer mains shall be shown at a scale no smaller than 1 = Plans shall contain profiles that have a horizontal scale of 50 feet to the inch, and a vertical scale of 10 feet to the inch. Plan views shall be drawn to the same scale. Plan & profile sheets shall show. A. Location of streets. B. Location, size, material of all existing & proposed sewers. C. Location of existing & proposed utilities including storm drains. 6 2.20 Continued D. Location of manholes, invert & surface elevation of manholes, grade of sewer between manholes (all manholes shall be numbered). E. All topographic features including stream crossing with elevations of stream F. All property lines including right of way & Utility and Drainage easements. G. A North arrow H. Alabama professional engineer s seal & signature. I. Bench mark elevations based on USGS Datum J. Sewer notes. 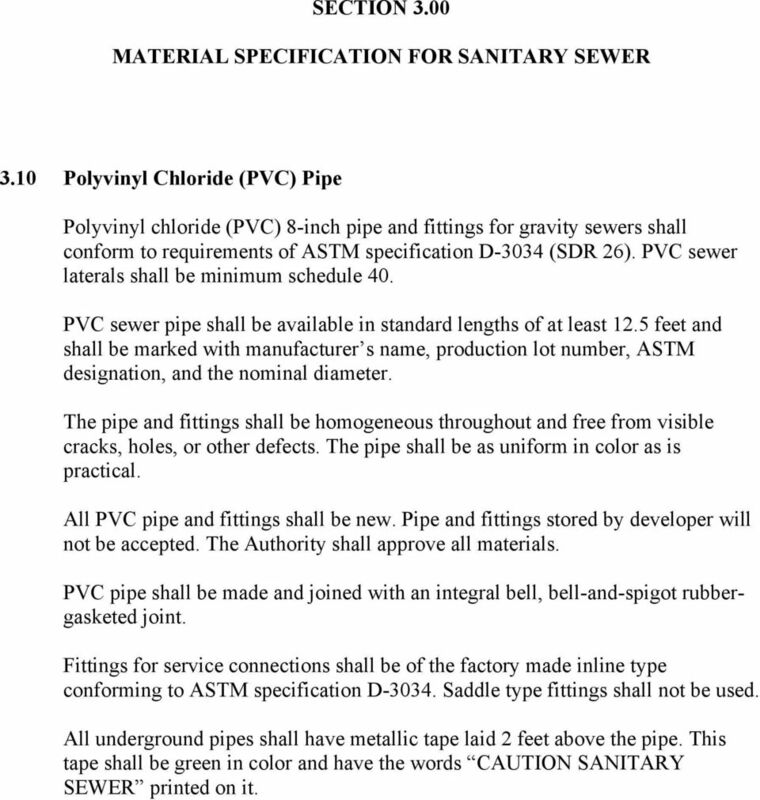 7 SECTION 3.00 MATERIAL SPECIFICATION FOR SANITARY SEWER 3.10 Polyvinyl Chloride (PVC) Pipe Polyvinyl chloride (PVC) 8-inch pipe and fittings for gravity sewers shall conform to requirements of ASTM specification D-3034 (SDR 26). PVC sewer laterals shall be minimum schedule 40. PVC sewer pipe shall be available in standard lengths of at least 12.5 feet and shall be marked with manufacturer s name, production lot number, ASTM designation, and the nominal diameter. The pipe and fittings shall be homogeneous throughout and free from visible cracks, holes, or other defects. The pipe shall be as uniform in color as is practical. All PVC pipe and fittings shall be new. Pipe and fittings stored by developer will not be accepted. The Authority shall approve all materials. PVC pipe shall be made and joined with an integral bell, bell-and-spigot rubbergasketed joint. Fittings for service connections shall be of the factory made inline type conforming to ASTM specification D Saddle type fittings shall not be used. All underground pipes shall have metallic tape laid 2 feet above the pipe. This tape shall be green in color and have the words CAUTION SANITARY SEWER printed on it. 8 3.20 Ductile Iron Sewer Pipe All ductile iron pipe shall conform to ANSI/AWWA C150/A21.50 and ANSI/AWWA C151/A21.51, latest revision. Minimum requirements for pressure class of underground ductile iron pipe are as follows: 12 diameter and smaller - class diameter - class 250 Larger than 24 diameter - class 150 The lining and coating for ductile iron pipe shall meet the following requirements: The interior of the pipe and fittings shall be cement mortar lined with bituminous seal coat in accordance with ANSI/AWWA C104/A21.4. The exterior of all pipe and fittings, unless otherwise specified, shall receive a standard bituminous outer coating. All ductile iron pipe shall bear the manufacturer s name or trademark, the year produced, and the letters DI or word DUCTILE. Joints for ductile iron pipe shall be push-on type such as Fastite, Tyton, or Super Bell-Tite or approved equal unless mechanical joints are specified. 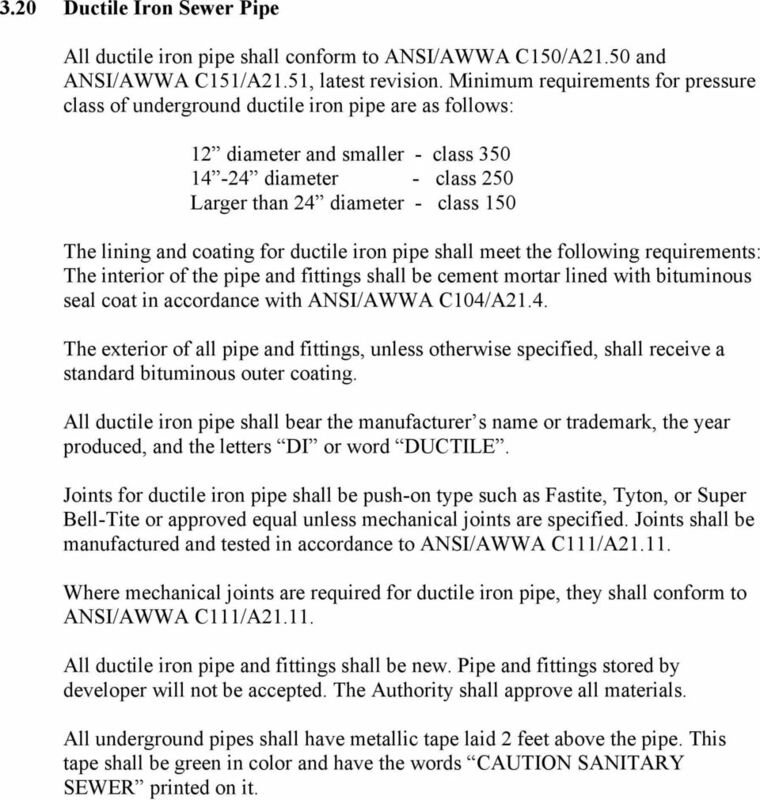 Joints shall be manufactured and tested in accordance to ANSI/AWWA C111/A Where mechanical joints are required for ductile iron pipe, they shall conform to ANSI/AWWA C111/A All ductile iron pipe and fittings shall be new. Pipe and fittings stored by developer will not be accepted. The Authority shall approve all materials. All underground pipes shall have metallic tape laid 2 feet above the pipe. This tape shall be green in color and have the words CAUTION SANITARY SEWER printed on it. 9 3.30 Casing Pipe Casing pipe shall be new material with minimum yield strength of 35,000 psi. Casing spacers shall be approved by the Authority. 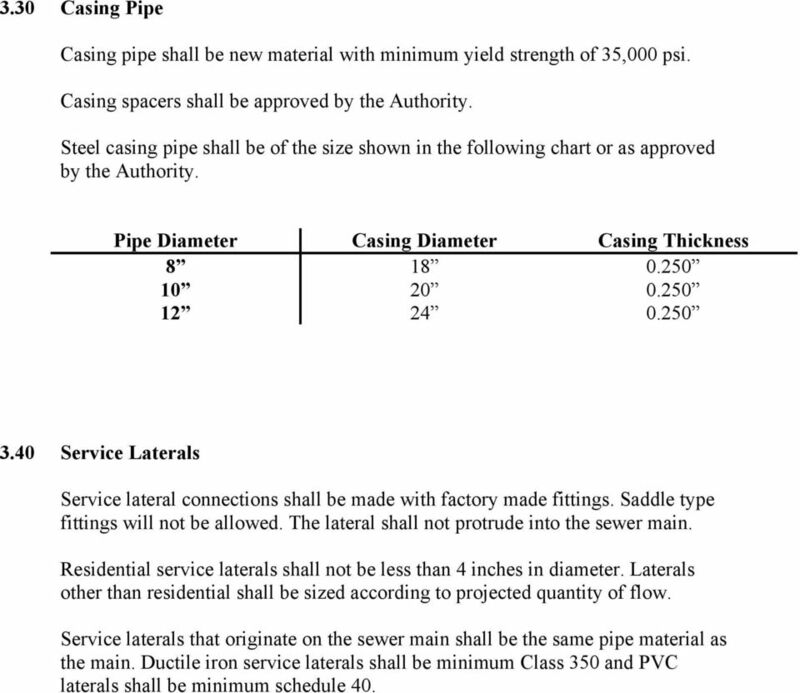 Steel casing pipe shall be of the size shown in the following chart or as approved by the Authority. Pipe Diameter Casing Diameter Casing Thickness Service Laterals Service lateral connections shall be made with factory made fittings. Saddle type fittings will not be allowed. The lateral shall not protrude into the sewer main. Residential service laterals shall not be less than 4 inches in diameter. Laterals other than residential shall be sized according to projected quantity of flow. Service laterals that originate on the sewer main shall be the same pipe material as the main. Ductile iron service laterals shall be minimum Class 350 and PVC laterals shall be minimum schedule 40. 10 SECTION MANHOLES 1. Manholes shall be installed at the upper end of each line, at all changes in grade, size, or alignment, at all sewer intersections, and at a spacing of no more than 400 feet. 2. The minimum diameter of the manhole will be 48 inches and shall meet the requirements of ASTM C-478. Larger manholes will be permitted for sharp changes in alignment and larger diameter sewers. 3. A drop inlet shall be provided for in/out invert elevations greater than 24 inches. 4. Manholes that are deeper than 36 inches shall have steps. Manhole steps shall be press set plastic, or approved equal. Steps will also be provided on the outside of raised manholes when the top elevation is greater than 3 feet above the existing ground elevation. 5. A bench shall be provided on each side of the flow channel when pipe size is less than manhole diameter. The bench shall slope 1 inch per foot. 6. Manholes in off-street locations shall be a minimum of 1 foot above finish grade. Manholes in flood plains shall extend 2 feet above the 100 year flood elevation or be provided with sealed covers and vented. 7. Raised manholes shall be no higher than 4 feet above the surrounding ground. 8. When connecting to an existing manhole the existing manhole shall be core drilled. Inlet and outlet pipes shall be connected to new and existing manholes with a gasketed flexible watertight connection. 9. All industrial dischargers shall provide a monitoring manhole and all discharge from the property must pass through one monitoring manhole before entering the Harvest-Monrovia sewer system. 10. All manhole covers will be perforated and marked SEWER. 11. All manholes shall be vacuum tested during the final testing procedures. 11 4.20 Service Laterals 1. Service laterals shall be factory made fittings. Saddle type fittings will not be allowed. The connection at the main shall be watertight and not protrude into the main. 2. 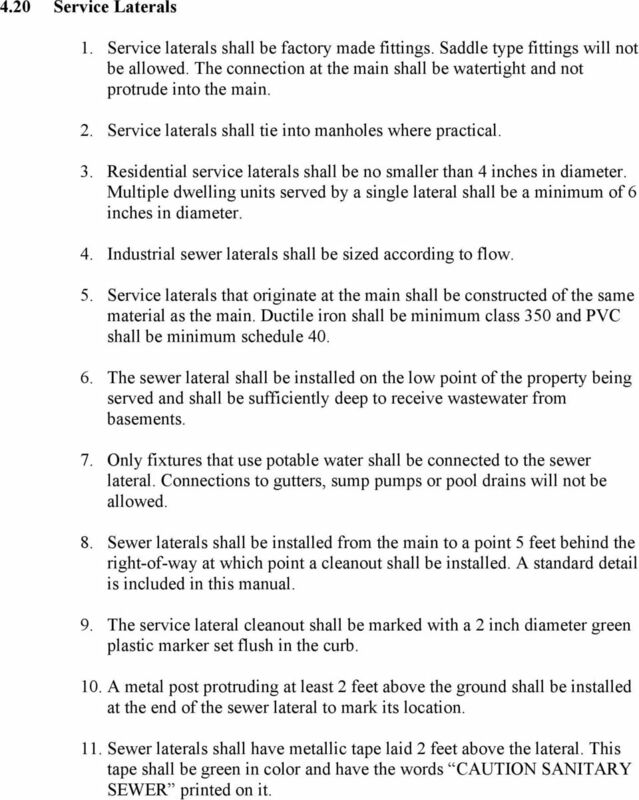 Service laterals shall tie into manholes where practical. 3. Residential service laterals shall be no smaller than 4 inches in diameter. Multiple dwelling units served by a single lateral shall be a minimum of 6 inches in diameter. 4. Industrial sewer laterals shall be sized according to flow. 5. Service laterals that originate at the main shall be constructed of the same material as the main. Ductile iron shall be minimum class 350 and PVC shall be minimum schedule The sewer lateral shall be installed on the low point of the property being served and shall be sufficiently deep to receive wastewater from basements. 7. Only fixtures that use potable water shall be connected to the sewer lateral. Connections to gutters, sump pumps or pool drains will not be allowed. 8. Sewer laterals shall be installed from the main to a point 5 feet behind the right-of-way at which point a cleanout shall be installed. A standard detail is included in this manual. 9. The service lateral cleanout shall be marked with a 2 inch diameter green plastic marker set flush in the curb. 10. A metal post protruding at least 2 feet above the ground shall be installed at the end of the sewer lateral to mark its location. 11. Sewer laterals shall have metallic tape laid 2 feet above the lateral. This tape shall be green in color and have the words CAUTION SANITARY SEWER printed on it. 12 SECTION 5.00 TESTING 5.10 GRAVITY LINES Prior to testing, all lines shall be cleaned of debris & flushed with clean water. Debris & water used for flushing shall be caught & removed from the line. All sewer lines shall be air tested in accordance with ASTM C828 as follow: 1. The sewer lines to be tested shall be tested between manholes. The line shall be sealed at each end. The seal at one end shall have an orifice through which to pass air into the pipe. An air supply shall be connected to the orifice. The air supply line will contain an on/off valve and a pressure gauge with a range from 0 to 10 psi. The gauge shall have minimum divisions of 0.10 psi, and shall have an accuracy of +/-0.04 psi. 2. The pipeline being tested shall be pressurized to 4 psi. The line will be allowed to stabilize between 4 psi and 3.5 psi for a period of no less than 5 minutes. If necessary, air should be added to the line to maintain pressure above 3.5 psi. After the stabilization period, the valve shall be closed. When the line pressure drops to 3.5 psi, timing with a stopwatch should begin. The stopwatch shall run until the pressure drops to 2.5 psi. 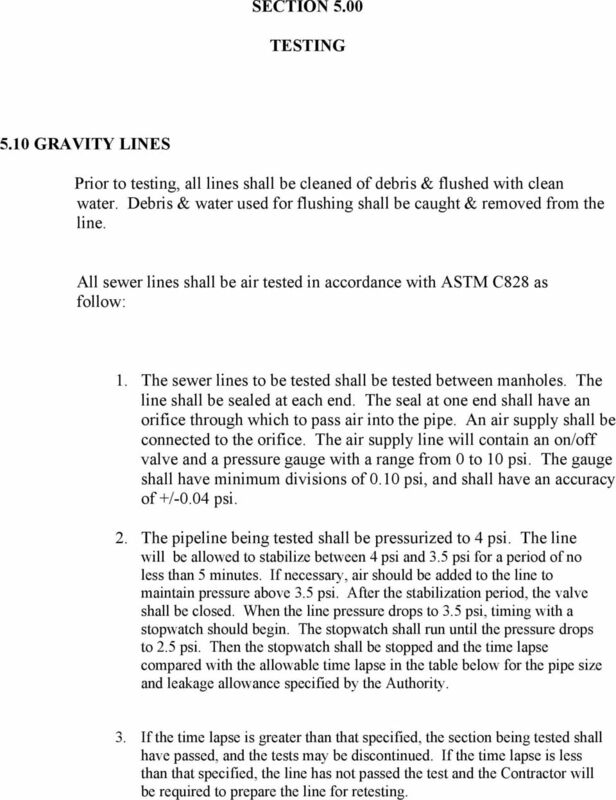 Then the stopwatch shall be stopped and the time lapse compared with the allowable time lapse in the table below for the pipe size and leakage allowance specified by the Authority. 3. If the time lapse is greater than that specified, the section being tested shall have passed, and the tests may be discontinued. If the time lapse is less than that specified, the line has not passed the test and the Contractor will be required to prepare the line for retesting. 13 Air Leakage Chart Size of Pipe (inches) Minutes: Seconds per 100 ft. 4 1:00 6 1:00 8 1: : : : : : : : :00 4. If the pipeline to be tested is beneath the groundwater level, the test pressure shall be increased psi for each foot the groundwater level is above the invert of the pipe. 5. Deflection tests of pipe may be required. Tests, as well as tolerances, shall be in accordance with the manufacturer s recommendations or as directed by the Authority and shall be conducted in the presence of the Authority Representative. An acceptable method of testing the deflection would be that the pipe shall pass a vertical floating pin-type go/no-go mandrel (or effective equivalent) sized to 95 % of the pipe diameter of the actual pipe used with the pipe placed and covered. The appropriate allowable deflection of the flexible pipe when installed (must be less than 5%) may be calculated using the pipe stiffness formula in ASTM D2321. Deflection tests shall be performed not less than 24 hours after backfilling. 6. Infiltration and exfiltration of groundwater or other leakage into and out of the sewer (including manholes) shall not exceed 100 gallons per mile of sewer per inch of outside diameter of the sewer per 24 hours in any section of the completed work, and in no case shall it exceed 2500 gallons per mile per 24 hours. Infiltration flow shall be measured in wet weather by a Vnotch weir with free discharge or other means acceptable to the Authority. Weirs shall be furnished, installed, and removed by the contractor. 14 5.20 FORCE MAINS All force mains shall be tested Hydrostatically. Prior to testing, the line shall be filled with potable water and the air in the line expelled. All lines shall be tested at twice the normal system operating pressure or to the pipe pressure rating class, whichever pressure is less. The Authority will determine the normal system operating pressure. 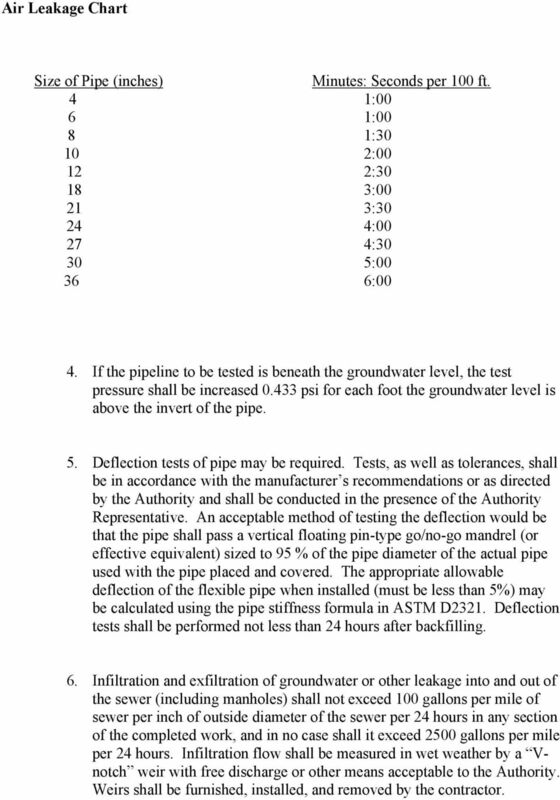 A pipe section shall be accepted as passing if the test pressure does not decrease more than 5% for the 6-hour test period. Any repairs made to the sewer line shall be inspected and approved by the Authority MANHOLES All manholes shall be vacuum tested. The following procedure shall be used: Isolate the manhole by plugging all pipe openings, permanently seal lifting holes and any other openings. A vacuum of 10 of mercury shall be drawn. The pump is then isolated and the time measured for the vacuum to drop to 9 of mercury. A passing test requires this time be greater than 60 seconds for a 48 manhole, 75 seconds for 60 manholes, and 90 seconds for 72 manholes. Any repairs required shall be made with non-shrinking grout TELEVISION INSPECTION Internal television inspection will be conducted on all new sewer lines. This inspection must be done in the presence of the Authority. The Authority must be notified at least 72 hours prior to any testing or inspection. An independent testing firm, as approved by the Authority, shall conduct the test. A copy of all logs, photographs, and tapes will be submitted to the Authority. 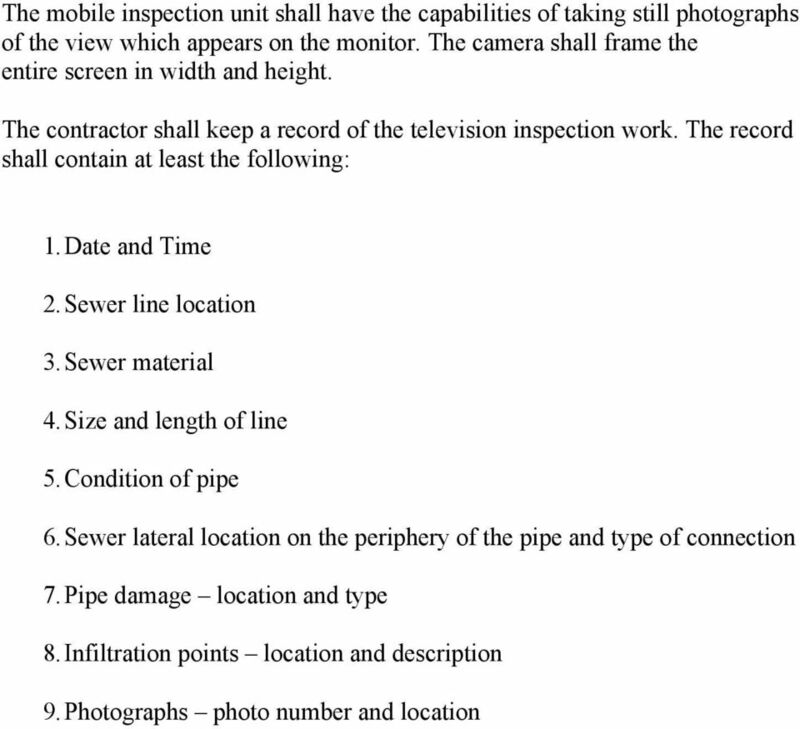 The television camera used shall be designed and constructed for internal sewer inspections. The camera monitor shall be located inside a temperature controlled mobile unit that will accommodate three people observing the line inspection by television. A skilled technician shall control the operation of the equipment at all times from control panel inside the mobile inspection unit. ASTM C76, Class III, Wall B, except as modified herein. Clean natural sand, ASTM C33. Artificial or manufactured sand will not be permitted. 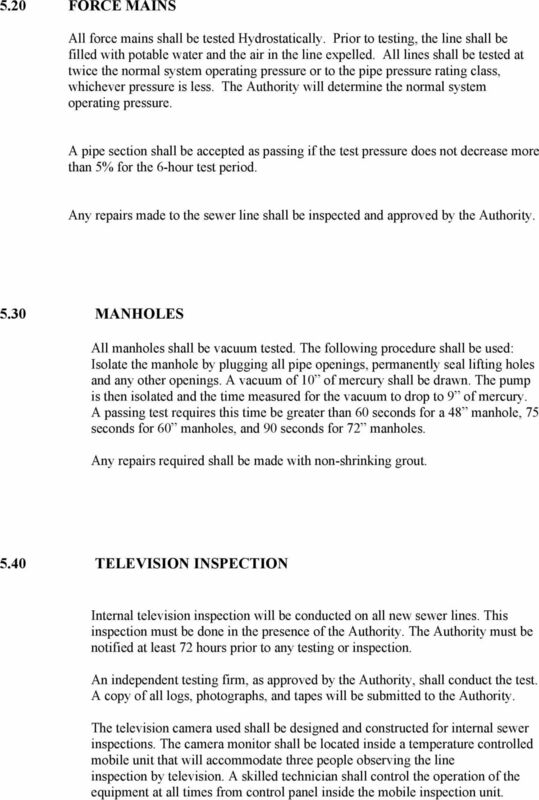 6-07-831 Page 1 of 12 1 FOR CLEANING AND TELEVISING EXISTING SEWERS, AS SPECIFIED, ANY REQUIRED CLEANING, ANY LOCATION, ANY LENGTH OF SEWER, COMPLETE IN PLACE, FOR VARIOUS PIPE DIAMETERS. A. EXISTING "